The further development of MeMo and the recruitment of new team members to design new exercises cost around 8,000 € per exercise. If each visitor of MeMo gave 10 €, it would allow us to secure the development of MeMo and the design of new games for a full year. MeMo is open-access and free, and we want to keep it free. But to develop MeMo we need a multi-disciplinary team (psychiatrists, neuropsychologists, software engineers, graphics professionals) to design, improve and adapt the exercises to the users’ needs. To keep working, we need donations. Any donation, even if small, allows us to keep going. 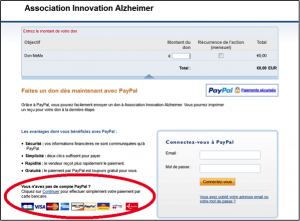 The Association Innovation Alzheimer is a general interest association. In the French legislation this recognition indicates that the association can issue fiscal receipts to its donors (individuals or companies) which can be used to waive a tax reduction of an amount normally corresponding to 66% of the amount paid, within a limit of 20% of the taxable income. If you are a taxpayer subject to the solidarity tax on wealth, you can also benefit from a reduction of wealth tax. You can find more details here (in french). 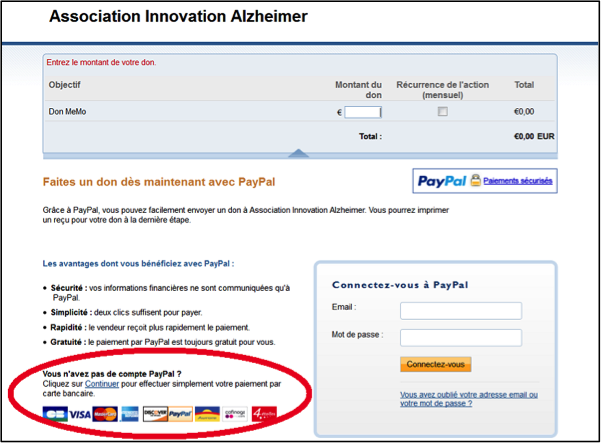 For further information, you can contact us by email at : contact@innovation-alzheimer.fr. Our last fundraising campaign allowed us to recruit a stagier for 4 months. He developed the exercise Recognition, collected the materials used in the Reminiscence exercise for healthcare professionals, and started to develop a memory exercise which will be soon online.